One of the biggest concerns many runners have when it comes to having a baby is how to maintain their active lifestyle while caring for a small child. Finding the time to work out can be a challenge at the best of times but with a new family to look after it can be even more difficult. 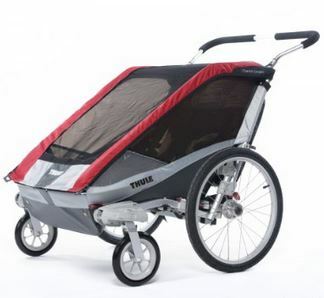 A good running stroller can be the answer to maintaining both your fitness and your sanity! With so many good strollers on the market it can be hard to choose the right one for you. Let’s break down some of the options! BOB is the leader in running specific strollers for good reason. BOB strollers are rugged and versatile making them perfect for families that are always on the go. The Revolution line of strollers got its name from the front wheel that swivels to make steering easy and smooth. While many running strollers’ locked front wheels force you to tip the stroller back to make a turn the Revolution Pro’s front wheel swivels with ease. On tough terrain the front wheel can be locked down to give you the extra stability of a steady and stable front end. The Revolution Pro boasts an adjustable suspension system that can be dialed in on to provide comfort for your child on any type of terrain and adjustable handlebars that will ensure your comfort as well! The five-point padded harness ensures that your child is safe and comfortable for the ride. The fact that the Bob Revolution Pro is extremely popular despite its hefty $499.00 price tag tells you something about it’s quality! This is stroller is the answer for the busy mom (or dad!) that likes to do it all. The Chariot is a regular stroller, running stroller, and bike trailer all in one! You can even attach skis to it to take it cross-country skiing or snowshoeing. There is nothing this stroller can’t do! If you are wanting one piece of baby gear that will let you do all your activities with your little in on tow, the Chariot is it. With the add-on Thule Chariot Infant Sling you can take babies as young as one month old out and about for some fresh air and sunshine. 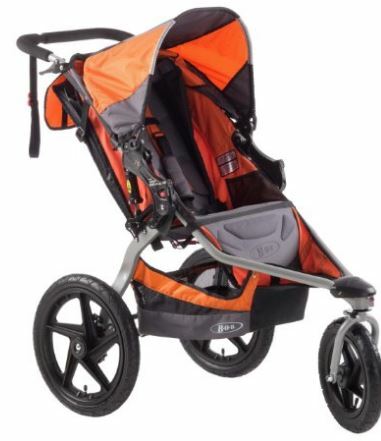 With it’s long wheelbase the Chariot might not be as nimble as a dedicated running stroller but it’s jack of all trades versatility makes it an excellent choice for women that can’t decide on just one sport. The Chariot’s steep cost ($650 for the base plus $100 for the running attachment) may scare some people away but if you are looking for a baby transport device that is truly meant to do it all there is simply no comparison. Phil and Ted’s markets its Sub 4 as the “world’s fastest jogger” and as far as we can tell, they may be right. The Sub 4 is a high end, high performance stroller designed for the runner that wants to take their little one on some fast runs! Beautiful and sleek, the Sub 4 fills a niche in the market for runners looking for a super quick and high end jogger. In designing the Sub 4, Phil and Ted’s took a hard look at the way real adults run with babies and came up with some features to make life a whole lot easier. Features like sloping rear wheels and adjustable handlebar height help to make this an ergonomically correct jogger that can take some of the discomfort out of all those miles spent pushing a stroller. But all that technology and well thought out design comes at a price. The Sub 4 retails at $899.99, making it one of the most expensive options on our list. 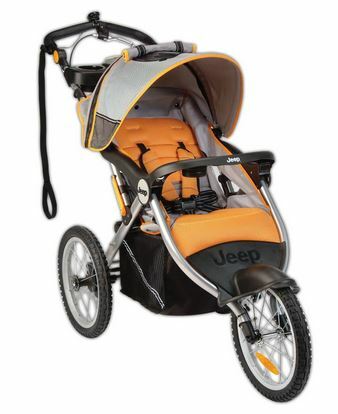 The Jeep Overland Limited Jogging Stroller is made to go the distance on all types of terrain. With its fixed front wheel, air filled tires, and hand break for downhill running it has all the necessary features of a great baby jogger but it is in the extra bells and whistles that this stroller really shines! The Overland Limited includes a speed-distance odometer, large storage basket, cup holders, and a sound system that plays music for both the runner and her passenger! If you like running with music but don’t like the idea of wearing ear buds when running with your baby, the Overland Limited may be a great choice for you. At $260.00 the Jeep Overland Limited stroller is also easy on the wallet! Unlike some of the other strollers on this list, the Overland Limited does not include a suspension system, making it less ideal for uneven or bumpy surfaces. The Mountain Buggy Terrain is a sleek and sturdy looking stroller with a lot of features and options that the avid runner will love. While many strollers have options for reclining the seat, the Mountain Buggy is one of the few strollers that will allow the child to lay completely flat, making it great for nap time runs. The adjustable handlebars allow this stroller to work well for runners of all heights and the extra distance from handlebars to wheels ensure that the wheels wont be kicked by runners with longer strides. The Mountain Buggy Terrain features a front wheel that can swivel or be locked in a forward or rear facing position giving lots of options to accommodate different running styles and surfaces. Retailing for $499.99, the Mountain Buggy is not the cheapest option but if you are a dedicated running mom it might be worth the splurge! While running strollers can be a bit expensive but they are also a worthwhile investment in your health and sanity! We hope this review has helped get you on the road to many miles of happy running with your baby! This entry was posted in Running Strollers and tagged Running Strollers.